Beginning with PDF 1.7, PDF documents can specify how a viewer application's user interface presents collections of file attachments (Portfolio), where the attachments are related in structure or content. Such a presentation is called a portable collection. The intent of portable collections is to present, sort, and search collections of related documents, such as email archives, photo collections, and etc. If attachment is present in a PDF document, the user interface presents the document as an attachment collection. 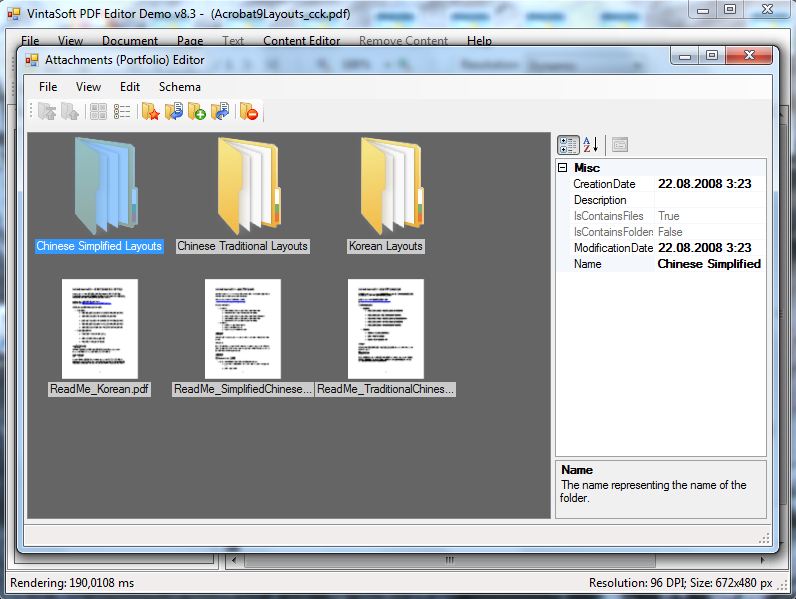 Beginning with PDF 1.7 Extension Level 3, an attachment collection can contain a folders for the purpose of organizing files into a hierarchical structure. Create, change, delete a portfolio of PDF document. 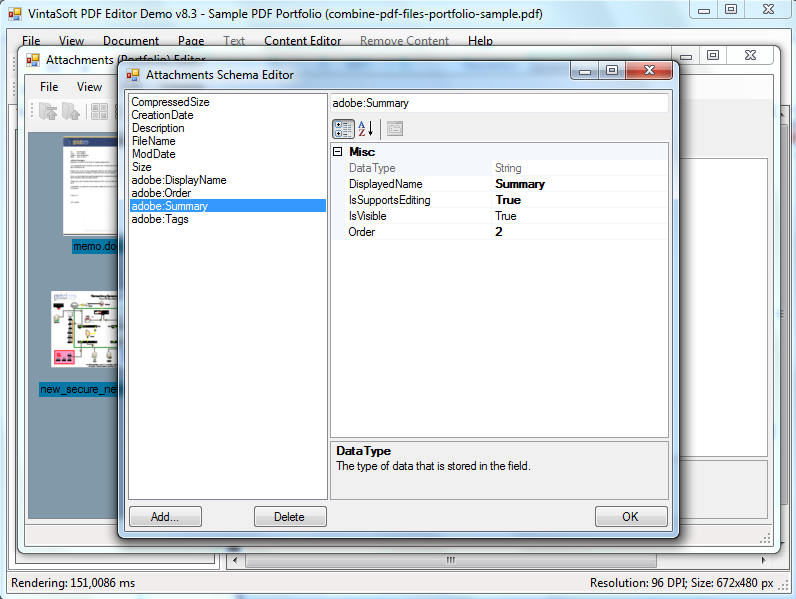 Obtain full information about a portfolio of PDF document (folder and files structure, portfolio, PDF viewer settings). 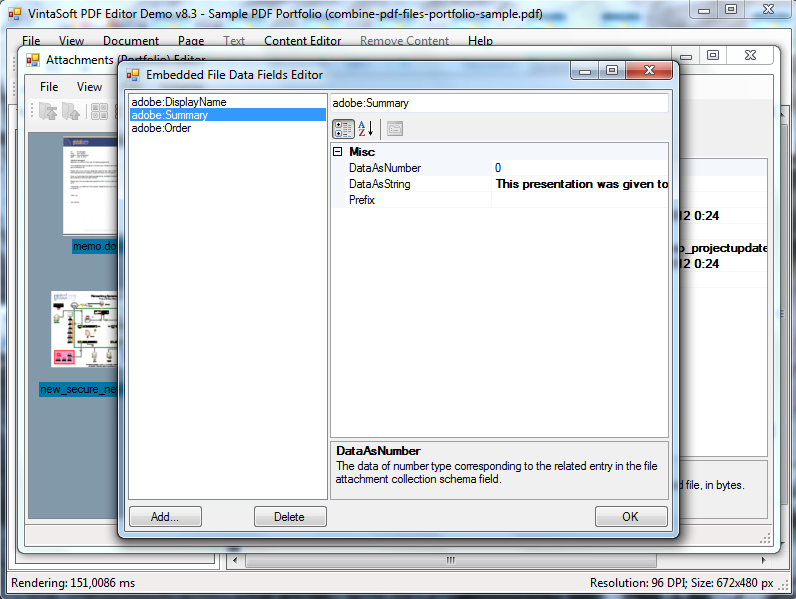 Configure the visual appearance of PDF viewer application while displaying the portfolio. Define the schema of data while displaying portfolio in detailed mode. Porfolio management using VintaSoft PDF .NET Plug-in. 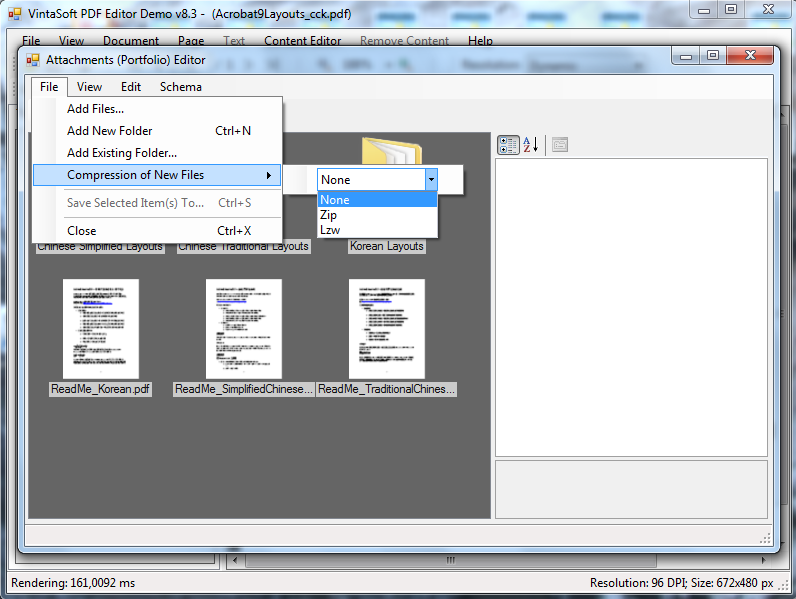 The new empty attachment collection (portfolio) of PDF document can be created using PdfDocument.CreateAttachments method. The current attachment collection (portfolio) of PDF document and related data structures can be removed using PdfDocument.RemoveAttachments method. The attachments collection (portfolio) can be accessed using PdfDocument.Attachments property. 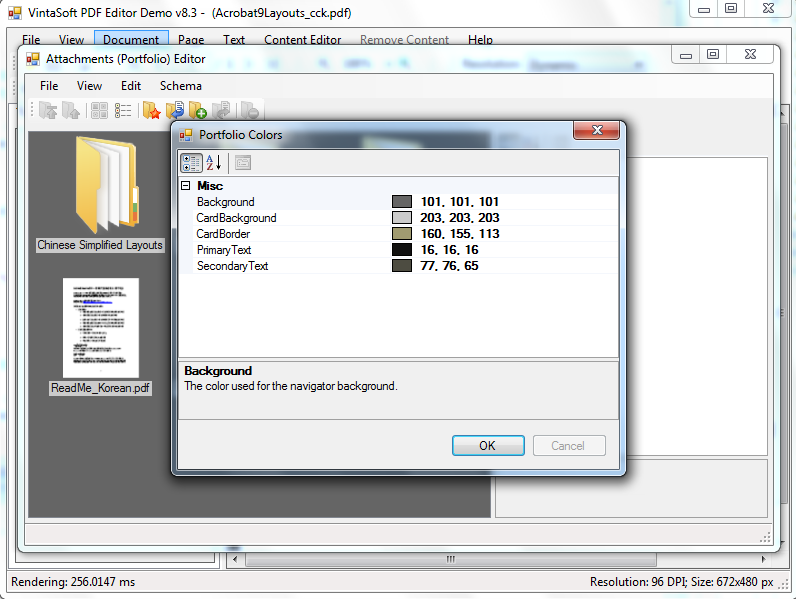 Visual appearance settings of PDF viewer application related with portfolio. PdfDocument.DocumentViewMode - the document view mode (PageMode) that specifies how the document should be displayed when opened (see PdfDocumentViewMode.UseAttachments). PdfDocument.ViewerPreferences - a viewer preferences that specify the way the document is to be displayed on the screen. PdfAttachmentCollection.View - the initial view of a collections of file attachments (DetailsMode, TileMode, Hidden). PdfAttachmentCollection.SplitterBar - split bar paramenters that specifies the orientation of the splitter bar. An attachments can be displayed in a split view, showing a navigator (or file list) in one sub-view and a preview of the currently selected document in the other. A splitter bar holds information that specifies the initial orientation (horizontal, vertical, or no split) of the splitter control and its position. PdfAttachmentCollection.Colors - a collection of colors that a navigator should use in its presentation of a file attachments collection. PdfAttachmentCollection.Sort - the sort parameters, which specifies the order in which items in the attachment collection should be sorted in the user interface. PdfAttachmentFolder.Thumbnail - the thumbnail associated with a folder. PdfEmbeddedFileSpecification.Thumbnail - the thumbnail associated with a file. PdfAttachmentCollection.Schema - a presentation schema of this file attachement collection, discussed below. Schema of attachement collection (PdfAttachmentCollection.Schema) defines data columns in the DetailsMode view mode. PdfAttachmentCollectionSchemaField.DisplayedName - the textual field name that is displayed to the user by the PDF viewer application. PdfAttachmentCollectionSchemaField.Order - the relative order of the field name in the user interface. PdfAttachmentCollectionSchemaField.IsVisible - the initial visibility of the field in the user interface. PdfAttachmentCollectionSchemaField.IsSupportsEditing - indicating whether the PDF viewer application should provide support for editing the field value. AttachmentCollectionSchemaFieldDataType.Filename - the field data is the file name of the embedded file stream, as identified by the PdfFileReferenceSpecification.Filename property of the file specification. AttachmentCollectionSchemaFieldDataType.FileDescription - the field data is the description of the embedded file stream, as identified by the PdfFileReferenceSpecification.Description property in the file specification. AttachmentCollectionSchemaFieldDataType.ModificationDate - the field data is the modification date of the embedded file stream, as identified by the PdfEmbeddedFile.ModifyDate property in the embedded file stream. 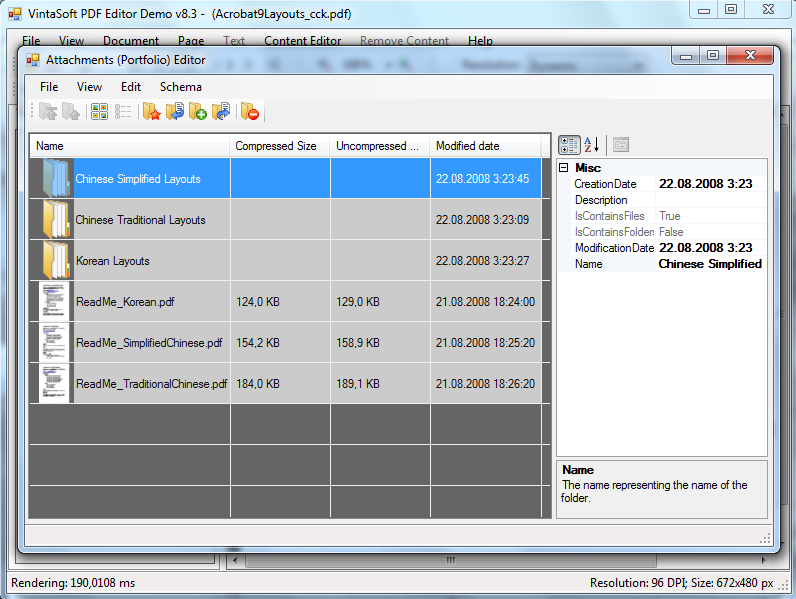 AttachmentCollectionSchemaFieldDataType.CreationDate - the field data is the creation date of the embedded file stream, as identified by the PdfEmbeddedFile.CreationDate property in the embedded file stream. AttachmentCollectionSchemaFieldDataType.UncompressedSize - the field data is the size of the embedded file, as identified by the PdfEmbeddedFile.UncompressedLength property in the embedded file stream. AttachmentCollectionSchemaFieldDataType.CompressedSize - the field data is the length of the embedded file stream as identified by the PdfEmbeddedFile.Length property in the embedded file stream. AttachmentCollectionSchemaFieldDataType.String - the field data is stored as a text string. AttachmentCollectionSchemaFieldDataType.Date - the field data is stored as a date. AttachmentCollectionSchemaFieldDataType.Number - the field data is stored as a number. PdfAttachmentFolder.DataFields - data field collection for a folder. PdfEmbeddedFileSpecification.DataFields - data field collection for a file. The key in the data fields dictionary is the name of the appropriate field of data schema (i.e. the key is in PdfAttachmentCollection.Schema dictionary).
''' Prints the portfolio structure.
''' Prints the folder structure.
''' Prints the portfolio splitter bar information.
''' Prints an information for specified files.
''' Prints the portfolio sort properties.
''' Prints the portfolio schema.
''' Prints the portfolio colors information. /// Prints the portfolio structure. /// Prints the folder structure. /// Prints the portfolio splitter bar information. /// Prints an information for specified files. /// Prints the portfolio sort properties. /// Prints the portfolio schema. /// Prints the portfolio colors information.
''' Assemblies a portfolio from files and folders from specified path. Dim sortFieldName As String = "Order"
''' Adds the path (all files and sub folders) to specified portfolio folder.
''' 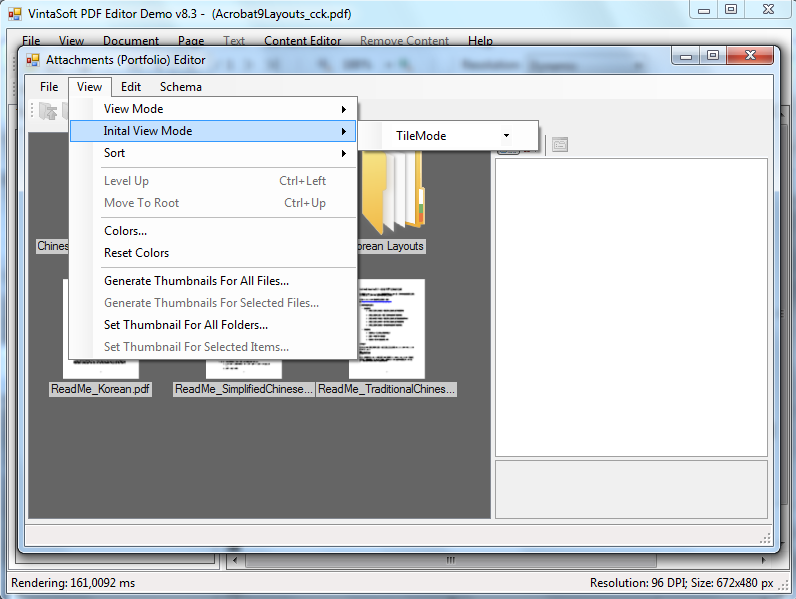 Creates PDF image resource with thumbnail of specified file. /// Assemblies a portfolio from files and folders from specified path. /// Adds the path (all files and sub folders) to specified portfolio folder. /// Creates PDF image resource with thumbnail of specified file. The demo application PdfEditorDemo/WpfPdfEditorDemo includes code, which allows to view, change, create an attachment collection of PDF document.